RB Rubber Products is an exciting, progressive and expanding company who has become a leader in the rubber recycling industry. Our success is attributed to maintaining a balance of high quality products and excellent customer service. Constant attention to these two core elements have allowed us to branch out to become the largest manufacturer and distributor for horse stall flooring in North America, and a key player in Fitness and Commercial flooring applications. 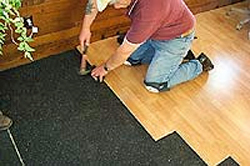 Today, we are recognized nationally as a leader in rubber flooring and rubber recycling technology. It is with a sense of proud accomplishment that we are able to take a waste material and turn it into a product that is in demand and still in use 5, 10, and 20 years later.